First written mention of Veľká dates back to 1268, the settlement of this municipality, similarly as those of the other Poprad town wards, however, was inhabited already in the Stone Age (end of the third millennium B.D.) In 1883 the Krompechers brothers casually discovered a bronze treasure in the Veľká cadastre, consisting of four swords of Early Bronze Age (12th century B.C.) The township was agricultural in character and thanks to its extensive and fruitful lands it supplied agricultural products also to its neighbours. In 1632 a paper mill was established here. Veľká expanded, culturally and socially, especially in course of the 19th century. In 1882 a group of enthusiasts indenting to promote the rising travel trade in the High Tatras and Veľká, founded the Tatra Museum in Veľká. Aurel Scherfel (1835-1895), the Veľká´s pharmacist, was one of the founders of the museum, and also one of its principals. Not only did he administer the museum collections, but also supported its foundation with a material financial amount. Scherfel was active in health care promotion and was a member of lots of specialist associations. He employed his love of botany in founding botanical gardens with alpine flora in Veľká and Starý Smokovec. He compiled several valuable Herbal Lists and issued a book on curative herbs from the Spiš region. In his laboratory he made chemical analyses of the Spiš mineral waters. In 1868-1870 he held office of Veľká´s Mayor. In his Last Will he devised the building to a kindergarten and also one of its houses to the town´s inhabitants. The building currently houses his memorial room, gallery and a small museum exhibition. 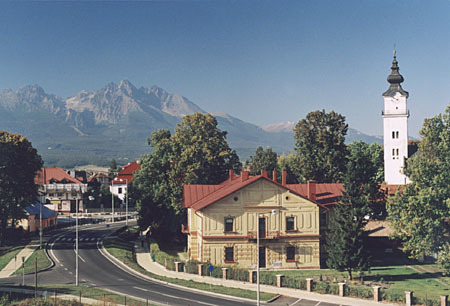 Veľká has currently turned into an economically dynamic town ward of Poprad with numerous small businesses, restaurants, baker’s, shops, publishing house etc... Veľká has an airport in its cadastre, built in 1938 and joining Poprad to several European countries. The visit of John Paul II, the Pope, who arrived by plane in 1995, as well as that of Queen Elisabeth II in 2008 were the most precious arrivals at the Veľká´s airport. Visitors going sightseeing around Veľká may see rare cultural monuments – Roman Catholic St. John the Evangelist´s Church of 13th century, Evangelic Holy Trinity Church of 1817 and Memorial Dedicated to the Victims of Communist Persecution of 2002.